Now before all of the requisite jokes (I’m looking at you, Tre) let me explain myself. Some (my husband, for example) may describe me as an impulsive shopper. This generally works out well when food shopping. I enjoy my Saturday morning visits to the Reading Terminal where I peruse the aisles of Iovine’s determining what looks good, what’s on sale and what’s seasonal. My weekly menu planning is generally determined by my market finds and I rarely walk into my shopping ventures with a list. OK, sometimes I come home with a random mix of items from Asian eggplants to kirby cucumbers (I’m going to pickle them, I SWEAR) and $1/head cauliflower that’s starting to go but it will be ok if I roast it tonight! In the same vein, however, I’m a loyal shopper. I won’t shop at a different produce shop or butcher just because the prices are better. Recently I decided that I was in the mood for chicken sausage. I don’t often eat sausage because I was raised Jewish and tend to steer clear from pork. My butcher, Harry Och’s, didn’t have any in stock so he directed me to the king of sausage, Martin’s, which was just steps away. I wandered over to Martin’s case and looked in awe at the myriad sausage varieties. I was immediately drawn to a chicken sausage with broccoli rabe and red pepper flakes. Yummy! And besides, it was on sale for $3.99/lb (down $1.) I asked for 8 links, which probably would have been about 3 pounds. While the man waiting on me did some calculations in his head, another older gentleman that works there was courting me in Italian “Ciao, Bella.” It was quite a scene. The butcher then informed me that he could save me some money if I wanted a 6 pound box of the same sausage for $18. $18?! That’s $1 savings per pound. I jumped on the opportunity and walked out the door with a huge box of sausage with visions of my already packed freezer dancing in my head. The next morning I woke up and started preparations for crockpot sausage and peppers. I took the box of sausages out of the fridge and opened it up. They look gorgeous, don’t they? But I was a little intimidated (that’s just the first layer.) I took about 10 links to brown before tossing them in the crock pot with a medley of peppers, onions and garlic with some canned crushed Tuttorosso tomatoes. They sell these in bulk at BJ’s and I go through them super quickly. Because I got started early, I was able to set the crock pot on low and forget about it all day long–until I heard the inevitable bubbling and the sausage aroma filled our house around 4pm. My oldest friend, Alexandra, who was in town to care for her father who had taken ill, came over for dinner that evening. Ironically enough, Alexandra is a vegetarian so despite the vat of chicken sausage, her dinner was a slice of tomato tart tatin (I’ll save that for another post) and salad. Unfortunately, I was so distracted by our conversation that I didn’t get any pictures of the sausage and peppers. Not one shot! It was darn good, though. I sent Alexandra home with a tupperware stuffed with sausage & peppers to put into her father’s freezer so he would eat well when she went back to Florida. Overall, the remainders lasted us a couple days of lunches and dinner. There was even some sauce left over that I tossed in the freezer. More on that later. A week or so later, it started to cool down and I hadn’t been to the market that week. I did a mental inventory of my freezer and cupboard and thought I’d throw together some sort of sausage soup. I was stuck on the idea of a tortellini sausage soup–who knows why–but didn’t have any tortellini. Instead, I remembered the red lentils I bought from International Food & Spices, the awesome Indian food market on Walnut Street. (Side note: they have great prices on bulk nuts.) I started playing around with my friend Google but wasn’t coming across anything appealing. Finally, after a few too many searches, I stumbled upon this recipe for red lentil soup with sausage and roasted peppers from a blog called “The Whole Kitchen.” Well whaddya know. I had just roasted up some red peppers a day or two earlier. Now, I’m not going to lie. Originally the idea of red peppers in this dish didn’t sound incredibly appealing to me and I probably wouldn’t have included them if I did not so fortuitously happen to have them in the fridge. Cook the sausage in a large pot, then drain the fat, scoop out the sausage and set aside. The original recipe didn’t specify if it was supposed to be sliced or crumbled. 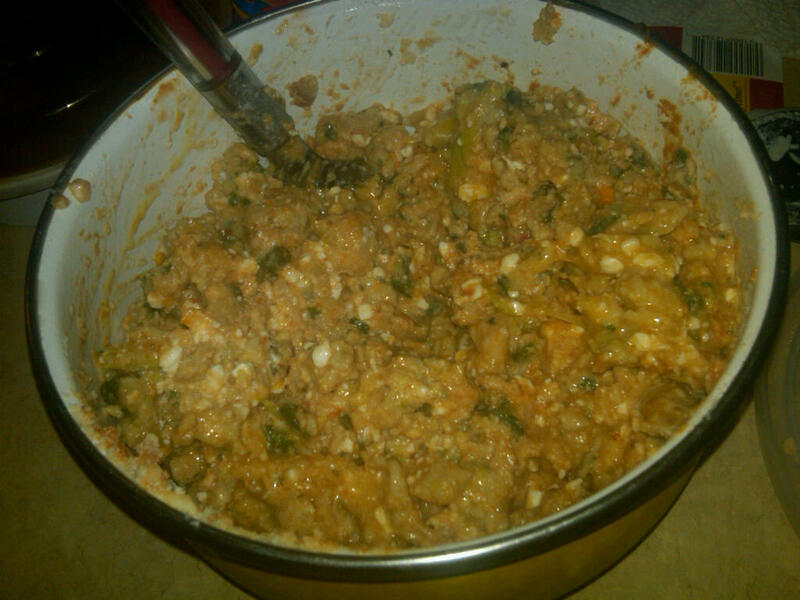 Therefore, I started with sliced and gradually transitioned to crumbled. Wipe out the pot, return to heat and add 1tsp oil. Add the onions, carrot and celery and and cook until the vegetables soften, about 10 minutes. Add the garlic, oregano and chili pepper flakes and cook until fragrant, about a minute. Add the wine, sausage, lentils, chicken stock, water, roasted red peppers, tomatoes, bay leaves and parmigiano reggiano rind and bring to a boil. Reduce the heat, cover and simmer until the lentils are tender about 30-45 minutes. Well, I typed that and then realized that I didn’t take any pictures. That might be a good thing, because it started to look pretty ugly around step 3. In fact, I was beginning to wonder if I had just ruined dinner. Hmm..ruining dinner isn’t the worst thing in the whole wide world because there’s always Los Jalapenos! Anyway, the soup was really, really good. The roasted peppers in question added a sweet bite that was countered by the necessary tang of the red wine vinegar. I will say that the broccoli rabe in the sausage added a great deal to the flavor (and appearance.) I was pretty darn proud of this soup and it was definitely a nice switch from my traditional chili for our fall and winter Sunday football meals. Now let’s see if I can remember what I added. One individual-sized container of cottage cheese (in place of the ricotta that I would have added if I had it), about a half cup of crushed tomatoes (Tuttorosso, duh), one egg, a sprinkling of parmesan cheese and probably some other stuff. But that’s all that I remember. I mixed it up well and then came the fun stuff. 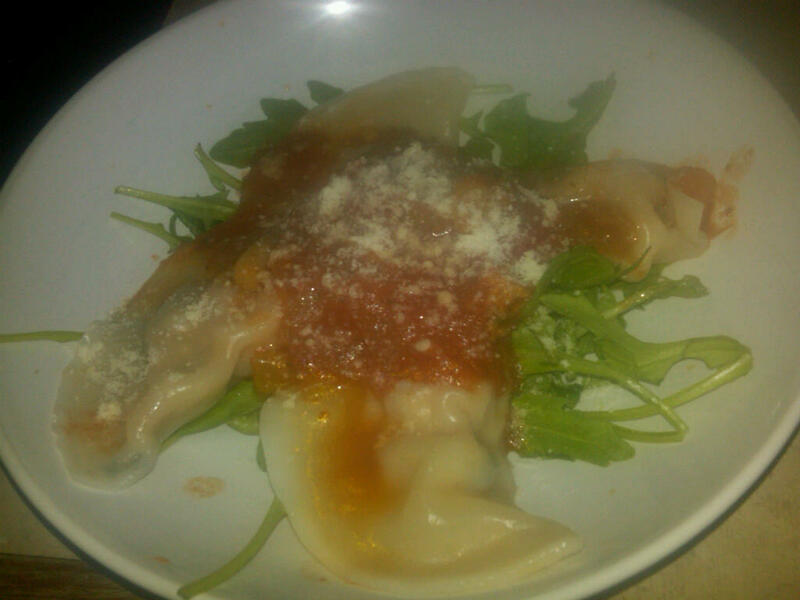 I broke out the won ton wrappers which are a GREAT ravioli/tortellini/etc/etc wrapper, by the way. My intial plan was to make tortellini but that plan was quickly foiled and I set out to try my hand at ravioli. The wrappers were just a tough old and weren’t a big fan of sticking to one another so I set out for option 3–half moon ravioli otherwise known as agnolotti. I mixed a little water and egg white and set it aside as a sealant. 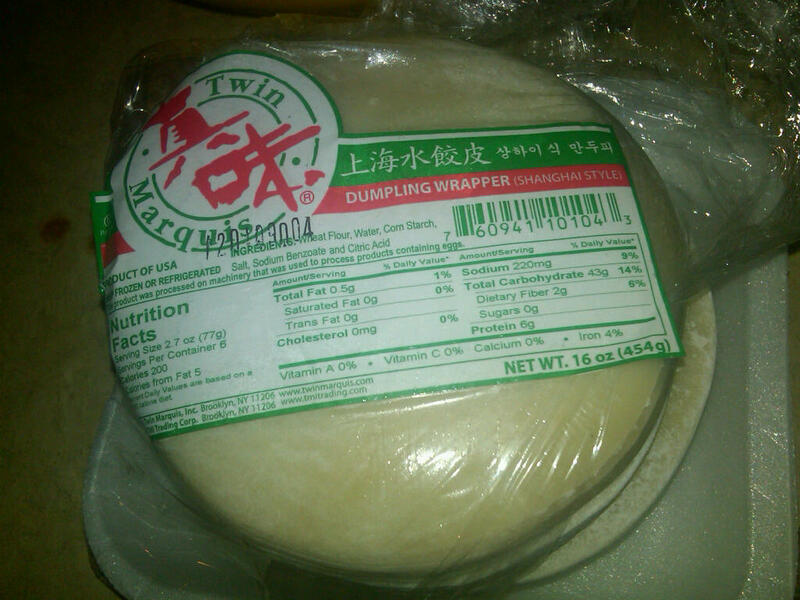 Each wrapper got about two tablespoons of filling and was folded over and sealed with the water/egg white mixture. 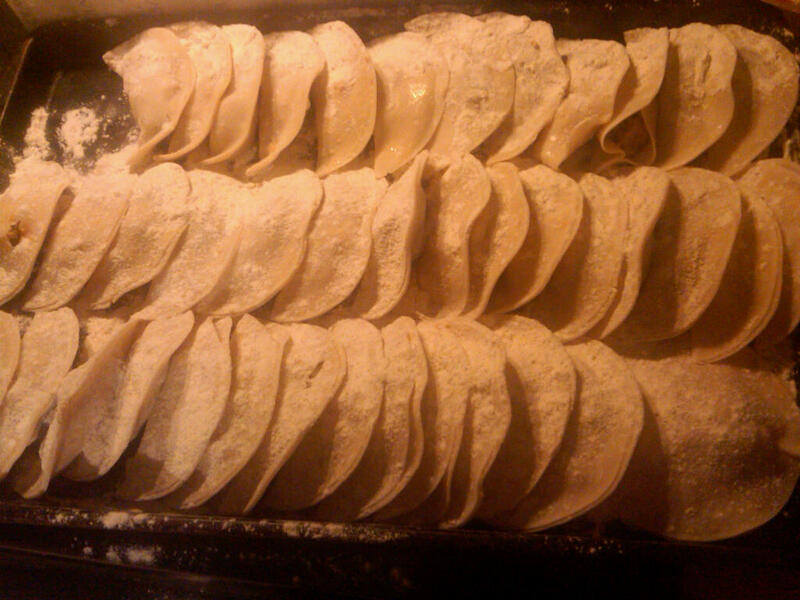 Then I tossed them all onto a heavily floured cookie sheet. 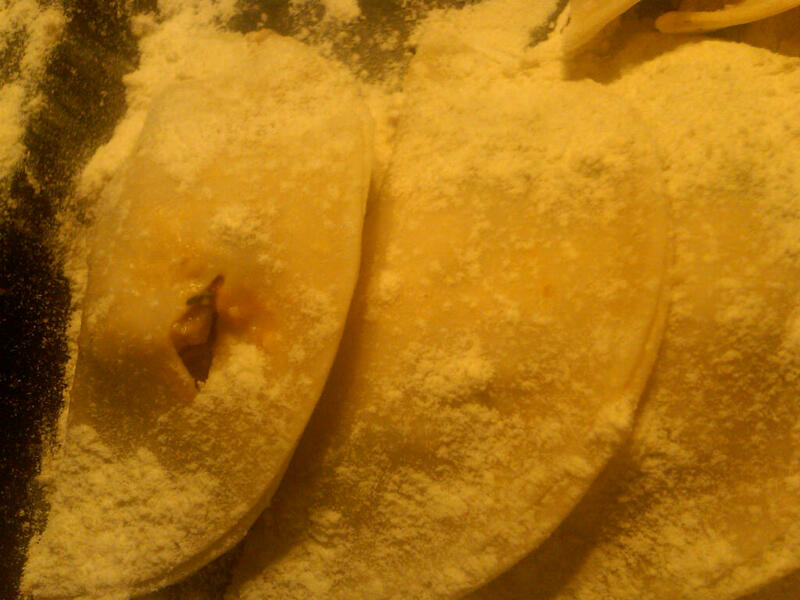 If you make these, it’s important to flour the sheet and the ravioli sufficiently so that they do not stick to one another. I snapped this shot before my final seal, but once they were all stuffed, I went back and prettied them up with the tines of a fork–this did double duty by resealing and making them a little nicer looking. That doesn’t mean I didn’t have some mistakes. Luckily, most of them came out better than the above! I fixed the hole with a heavy application of water/egg white mixture and prayed that it would stay together while it cooked. I tossed them into some heavily salted boiling water and cooked until they rose to the top, about 4 minutes. I then placed them on a bed of baby arugula and topped with the left over sauce from the sausage and peppers the previous week–how’s that for utility! They were quite tasty–even my husband kept commenting on how good they were. In fact, he loved all iterations of the six pounds. I wonder which was his favorite? I can’t wait to make these again. With the caveat that they are slightly time consuming, the actual dish is quite easy to make and, if I could be so humbled, I would say that they rival any nonna out there! 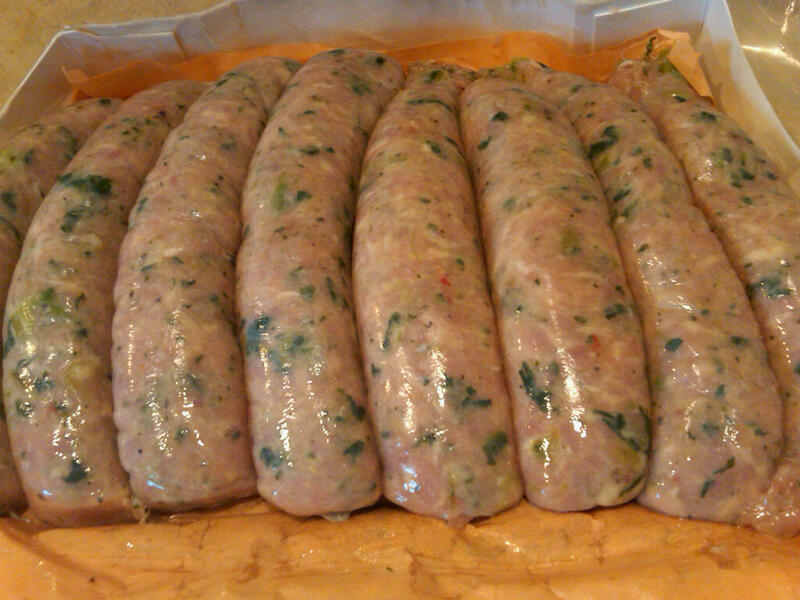 And that, my friends, is what you can do with six delightful pounds of chicken sausage! 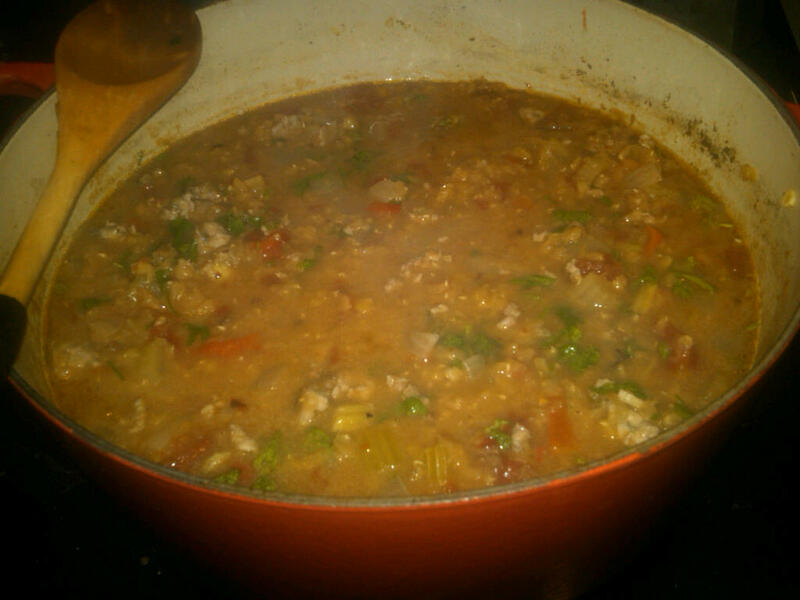 Thanks for the blog shout out – glad you liked the soup! And it looks like you’ve done very well by your sausage bargain…that’s the kind of shopping that would hear no complaints from my husband!